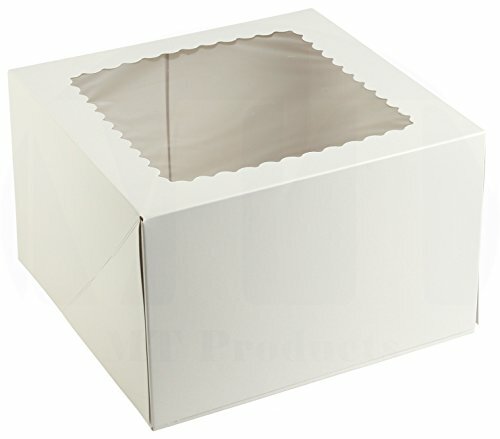 This 8" x 8" x 5" auto-popup window pie / bakery box is perfect whether you are packaging and selling cakes, pies, cookies, cupcakes, or your muffins. It's made of durable SBS paperboard with two clear window panels, perfect for showcasing your products to potential customers. This bakery box comes flat and preassembled with an auto-popup feature that allows it to fully expand in seconds, eliminating time and effort wasted on assembling traditional fold-and-lock boxes. With it's user-friendly design, this box will help you pack and present baked goods quickly and easily. It also features a crystal clear window panel so you always can see what's inside. If you have any questions about this product by MT Products, contact us by completing and submitting the form below. If you are looking for a specif part number, please include it with your message.